We’re now into week 4 of the CrossFit Opens with just one more workout to go after this! We’ve witnessed exercises that we thought were not possible (but now we know they are) and we’ve learnt a lot haven’t we?! I knew my clean and jerk would be ok as I am strong in lifting but I felt that my toes to bar would need some technical improvement. I planned and practised single toes to bar and multiple toes to bar, realising I needed to use my knees to tuck in and flick up the toes to bar to save energy rather that using a full scissor action. I made my first attempt today. I had it through to rep 12 and completed 5 reps at the clean & jerk. Attempt 2 at Gym Box with Rusty coaching (@motiv8rusty). Completed a 5k sprint warm up and mobility exercises before completing a warm up and some tactical advice from Rusty. I completed 8 reps into the 12 rep round and very pleased with my score of 44. Looking at the leader board, most ladies were getting between 40 and 43 with only the elite scoring above 50 so I was super happy with myself! Knowing I had completed 13.4 my athlete within was unleashed and I put myself up against another to complete Fran & Cindy which are two challenging CrossFit WOD’s. 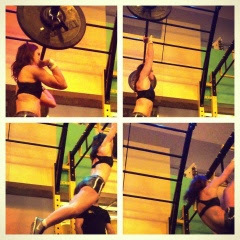 Read more about each of them here: http://www.crossfit.com/cf-info/excercise.html#Girls. My weakness being the pull ups in Cindy I knew I wouldn’t win this WOD but I knew I didn’t want to drop more than one round behind. I kept a steady pace and stayed on the heels of my opponent throughout. Both completing 24 rounds – we even added in a deadlift at the end of each round for 3 reps. Round 2 of competition – I knew that both Diane and Nancy would be strong workouts for me. Deadlifting is one of my favourite exercises which uses every muscle in your body and more recently I lifted 100KG which is double my body weight and my personal best. Squatting is a strong exercise for me and weaker for my opponent, so I knew I could use this to my advantage even though I would drop behind in the pull ups and hand stand press ups. I completed 3 rounds of Nancy in 11min 15 sec taking first place by a 4 minutes. Next Diane, only just making it through first but need to work on hand stand press ups and the depth of my press. There we have it! 13.4 in the bag with one more workout to go…13.5! What will CrossFit have in store? !